The May Day bank holiday weekend proved busy for one Peak District rescue team, with four callouts and an award to collect. 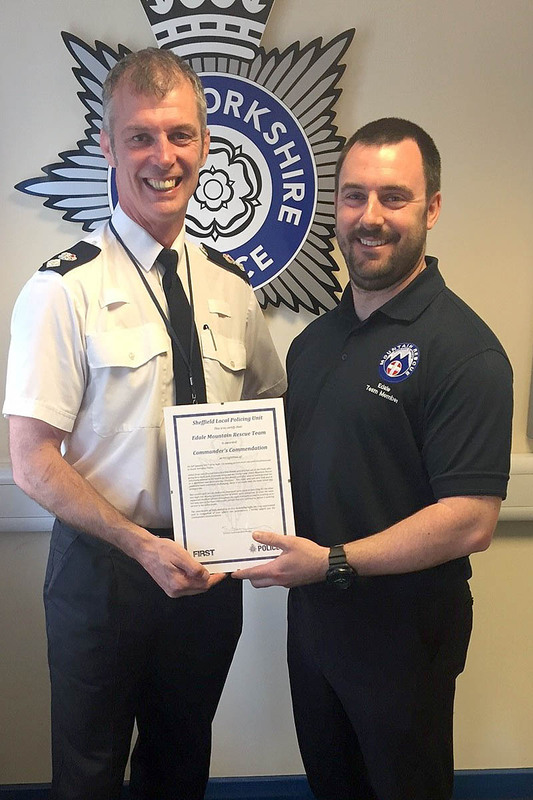 South Yorkshire Police presented Edale Mountain Rescue Team with the commander’s commendation for two consecutive search incidents that took place in January this year. The first request was for a walker who reported herself lost in the upper Derwent Valley with temperatures below freezing and worsening wintry weather. A team spokesperson said: “Thankfully she was located by one of our team sections, safe and well. “She was walked back to the trackside before being returned to her vehicle. “Later as members were returning home, a team vehicle stopped to liaise with South Yorkshire Police officers near to Lady Canning plantation. Officers were conducting searches for a vulnerable male missing from the Sheffield area. On Saturday evening, team members were asked to help Buxton Mountain Rescue Team with an incident near the top of Winnats Pass. “A Duke of Edinburgh’s Award participant nearing the end of their walk had slipped and fallen on some wet rocks, injuring their ankle and head in the process – fortunately not too seriously – but enough to stop them completing their walk,” the team spokesperson said. Team members who were at their base tidying up from bank holiday fundraising activities were rapidly at the site. After assessment and splinting of the ankle, the walker was wrapped up in a casualty bag and put on the stretcher. The team was in action again on Monday when it was contacted by Yorkshire Ambulance Service to help a man who had been taken ill while walking on the Derwent moors. The spokesperson said: “Local team members were rapidly on scene, locating the casualty not too far from the road. “A team doctor checked the gentleman over, and he was carried back to the road on a mountain rescue stretcher. Later on Monday evening the team was contacted again by Yorkshire Ambulance Service to assist their crews with a young lady who had fallen from a rope swing in the Charnock area of Sheffield. “Despite there being road access nearby, the patient was down at the bottom of a steep wooded valley.